Like I explained on my previous post, I was finally able to take my old electric wheel chair platform and remote control it by using a very simple decoder that takes RC PWM signals and generates DC Motor PWM signals. 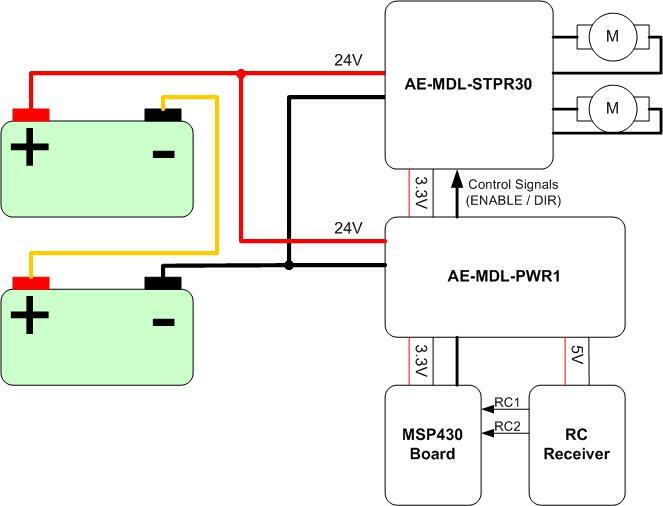 For this project I used an MSP430 to sample 2 RC PWM signals, decode them both and generate 2 ENABLE PWM signals that were fed into my Dual DC Motor controller with up to 30A capability. I also used another recent design, my AE-MDL-PWR1. This is a dual DC/DC power converter. The idea is to take the 24V from the battery and efficiently generate 5V and 3V needed for the different electronic blocks such as the micro controllers and the FM receiver. A block diagram below depicts the basic wiring for this simple implementation. But nothing better than actually seeing the project in action. The video can be enjoyed below. Next step, starting to add some intelligence and cool gadgets such as shaft encoders, sonar range sensors and a camera!